Today we’re changing the name from cryptoinfluencers.io to hive.one and entering Phase 2 of the project. Phase 2 is about building products that can be useful to the crypto community on daily basis. Phase 1 was about validating whether the accuracy of our algorithm is sufficient to do that. Today we concluded this nine months-long experiment. 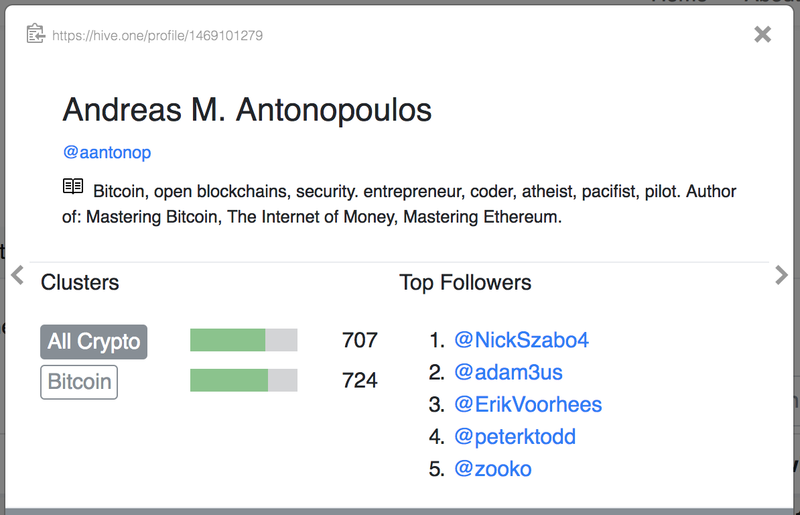 Old: An algorithmically generated list of crypto’s most influential people on Twitter. 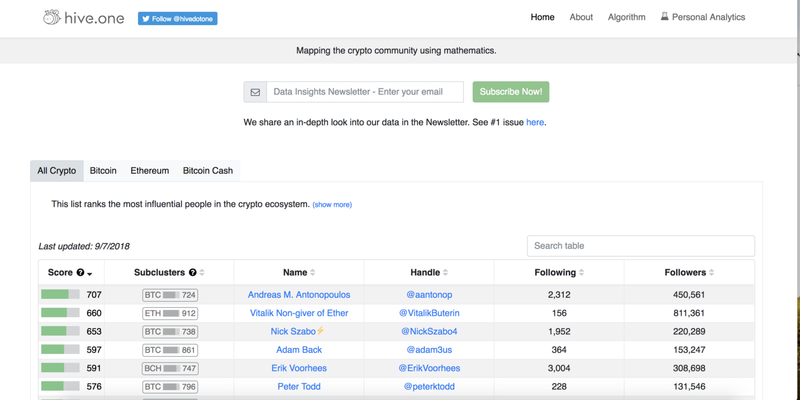 New: Mapping the crypto community using mathematics. Part one explains the experiment that was conducted in Phase 1. Part two outlines the plans for the project going forward. We designed the first prototype of the algorithm in December 2017. The initial outputs were promising. When we looked at the results, they seemed more accurate to us than any other lists. This created an odd problem: if we indeed produced the best list, how can we verify that? Even more importantly, as we try to improve it, how do we know we’re making it better and not worse? We concluded that the way to create a benchmark was to show the list to a large number of people and quantify their reactions. Each reaction would serve as a data point. In order for these data points to create a reliable sample, we would need to gather at least hundreds and preferably thousands of them. That’s how the idea of setting up cryptoinfluencers.io was born. It was designed to be an experiment, not a startup. For this reason, we haven’t raised VC funding yet and we tried to stay frugal to be able to kill the project off if the algorithm turned out to be flawed. We assumed that influence is predicated on attention. We designed a 2nd order metric that not only quantified who pays attention to you, but also who pays attention to the people who pay attention to you and so on. You can read more about the algorithm here. We started with Twitter data, but our assumption is that the same dynamics should repeat across various datasets. We are planing to incorporate other data sources over the next months. We needed a large sample size. That led to the decision to publish the ranking of the most influential people and make it somewhat sensational. When Forbes or another magazine create their lists, it usually makes rounds in social media. We assumed that people who rank high would want to share this fact with their followers. This assumption was correct. 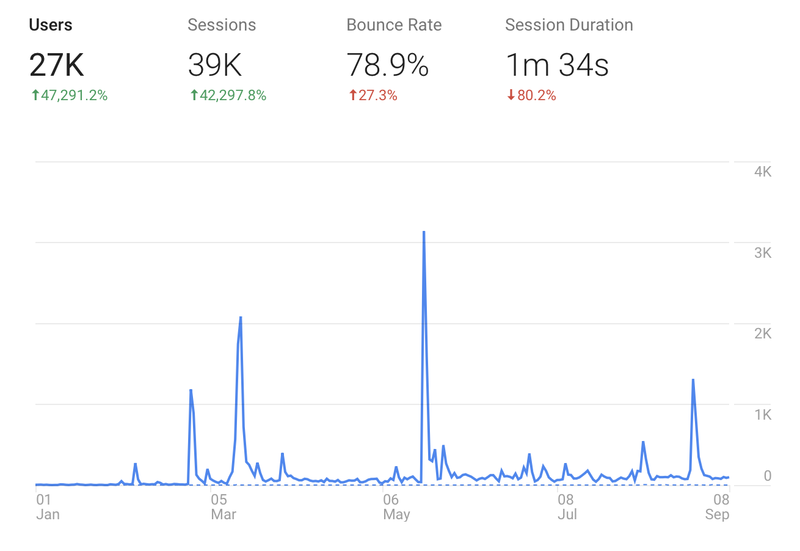 Since the launch in January, our website received over 27,000 unique users and it had over 39,000 sessions. Our tweets have received over 1 million impressions. A big portion of our overall traffic came from a handful of tweets from high profile accounts. We “battle tested” our results under scrutiny from a large number of people. We finally feel confident enough to start turning them into products. It does not mean that the work on the algorithm is done. On the contrary. We know we can make it far more accurate and this remains the priority. Phase 2 is about building things that are useful to the crypto community on daily basis. Crypto is a massive global community. We estimate that there are already over 1 million people involved in it. No human can keep track of such a large group. We need to move this computation from the brain onto a chip. We believe that every community can be described mathematically. I.e. we can quantify how influential each member is and in which groups. Not only that, but we can also track what content is making waves in the community so that it is easier to keep track of the latest developments. There are thousands of posts and papers coming out every month. Nobody can keep track of all of that. But in order to stay on top of things, one needs to be familiar with the most groundbreaking contributions. There are new podcasts and events popping daily. It’s hard to pick what’s worth your attention. Startup ecosystems were equally lively. But they were much smaller. They were built around specific cities and one could keep track of what’s going on through a network of friends also embedded in the community. Crypto is simply too large for that. We think that this problem can be solved with the help of algorithms. Algorithms that understand these elements of the ecosystem by observing the behaviors of its participants. We are publishing the lists of the most influential people in each cluster. The influence is calculated based on the sum of the attention that the other members of this cluster pay to a given person. We’ll expand on the methodology in the section below. The main purpose for the lists is to serve as the navigation tool. You can scroll through the list and, once you find a person you’d like to learn more about, click on their name to open the Profile. Currently, the lists are not very long — they have a couple of hundreds of people each. However, we are planning to expand them to thousands or even tens of thousands of rows. For this reason, it’s important that they offer sorting functions. We are working on expanding the list and including all major communities. We think that we can go even further and perhaps identify subclusters within these subclusters. Furthermore, we are experimenting with mapping clusters independent from crypto. For instance, cybersecurity, data science or AI. This would allow sorting the table for people who, for example, are part of the crypto community and AI research communities. Profiles are intended to give a quick and accurate overview of a given person’s expertise, network, and affiliations. Player-cards in FIFA allow the user to easily selected a team. They display the most important stats about each player at a glance. Our profiles are intended to do the same. One way to think about these profiles is as player-cards in a video game FIFA*. Cards display key statistics about each player. This way users can pick their teams without having a distinct knowledge about every player. We think it’s a handy analogy. We intend our profiles to provide a quick overview so that you can easily find out if a given person is, e.g. knowledgeable about cybersecurity. One thing is to see that somebody described themselves as an expert. The other is to see whether other experts in the field pay attention to what this person has to say. We quantify the latter. The profiles are meant to display this information. We have more useful data that is currently available on the website. We have been experimenting with using it to build tools for our own needs. For instance, when we first ‘went viral’ on Twitter, we were overwhelmed with the pace we were gaining followers. We went from 83 to over 1500 followers in 3 days. 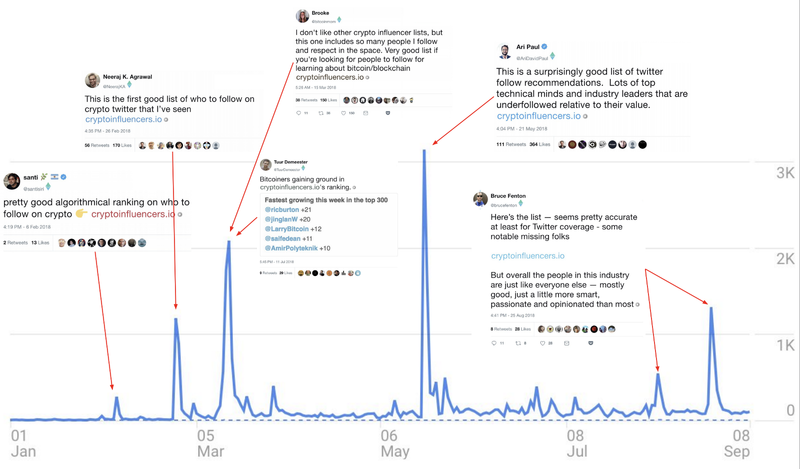 Many of them were some of the most influential people in crypto. Keeping track of who was following us was hard. So we built a simple tool that exported our followers and ranked them in a spreadsheet per their scored influence. This turned out to be incredibly useful. Now we are working on making this tool available to everybody. At the moment, you can sign up for the waiting list. If you visited our website before, you will notice that we replaced “Rank” with “Attention Score”. There are a couple of reasons for that. First, we don’t want to “rank” people. We couldn’t avoid that in the early phase of the project, but now we’re going for more subtle ways of indicating influence. Second, Attention Score is a more precise indicator of one’s position in a given group. Attention Score indicates one’s share in the group’s attention. It’s a 2nd order metric. This means that it matters not only how much attention someone pays you, but also how much attention this person receives themselves. Attention Scores are on a scale from 0 to 1000. We are planning to make more metrics available in the coming months. “Hive” is inspired by the “hive mind”. It’s a longstanding idea not only in science fiction but also in philosophy and in other disciplines. It envisions humanity as a collective brain where each one of us acts as an individual neuron. We believe that’s where the humanity is going and the network that’s forming through the crypto ecosystem is a step towards that. We hope to add to that process by enabling more efficient connectivity. Why “.one”? This part speaks to the philosophy of the product. We’re not building another platform, but rather a universal data layer. Our vision is to open up all the data that hive.one is using. We want everybody to be able to build their own platforms having access to exactly the same data. If you’d like to start building with this data, please reach out to us. *Thanks to Mattia Gagliardi for suggesting this analogy.